Talk about 'super-vision' - DC has hired David Goyer as a 'caretaker' to supervise it's upcoming Superman movies. While that tidbit of news was flung around the net faster than a speeding lethal projectile, Marvel placed the future of one of it's icons into equally safe hands, with artist Butch Guice set to join writer Ed Brubaker this May, in continuing his dynamite run in the pages of Captain America. The best part? 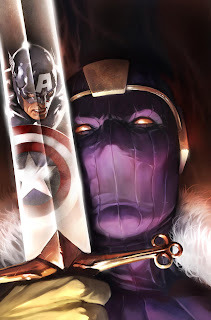 The duo are kicking off their latest stint with the return of Baron Zemo. As part of Marvel's focus to return it's books to a 'Heroic Age', the issue will see Bucky Barnes, now Captain America, face to face with the successor of the man who 'killed him' the first time, and one more than ready to finish the job. While that's cool and all, the master-plan that catapulted Zemo into my mind as Cap's true arch-nemesis, was this little ditty from the 1980's Captain America cartoon. Featuring Iron Man, Thor, Baron Zemo and the winged horse riding Black Knight (among others), its little dated self is still the first thing I think of when 'Baron Zemo' is mentioned.